Recently I did a 12hr TT and a 24hr race back to back on consecutive weekends – plus a 600k Audax in less than 24 hours the weekend before that. Most ‘normal’ people would say doing any of these events full stop would be mad enough, let alone doing them back to back. It isn’t something I would recommend or do regularly, but there is some reason to this madness. But… it paid off with two big PBs and, more importantly, too big ticks in the ‘confidence’ box on my journey to the LEJOG record attempt in September. The first race was the 12hour TT organised by Newbury Road Club on the A31 near Farnham. It is a course based entirely around a 20-mile stretch of dual carriage way. This makes it really easy for supporters. Unlike some other events, there is no need to try and work out which ‘circuit’ the marshals may have moved riders onto. The Cycling Time Trial regulations stipulate that competitors may not be overtaken by their support vehicle more frequently than once every 10 miles, providing the race is longer than 100km. This course is so compact that many riders choose to have their supporters just in one location, which makes for a great atmosphere. Anyone who has ridden this course, but particularly the far end towards the Chawton RAB, will understand why I both love and hate this course. On a good day, and even on an average day, the course has the potential for some really fast times. Particularly the section going back East towards the Coxbridge RAB is often super speedy with a smooth surface and a prevailing tailwind. However, the road surface at the ‘far end’ of this course, going West towards the Chawton RAB is rough, full of bumps and a few potholes for good measure. Even after 12 hours of riding, I still haven’t found the best line of riding this section of the course without being shaken about. Judging by the number of riders who have lost water bottles or broken parts of their bikes on this section, I think the perfect line simply doesn’t exist. The number one piece of advice for this course has got to be to double-check you have tightened up every bolt on your bike! Although this course is fairly local to me (45 minutes to 1 hour drive), it was an early race start (07:07 for me), so I had decided to arrive the day before and stay locally at an AirBnB. I also took the opportunity to drive the length of the course again, to remind myself of the locations of potholes and scout the best places for bottle hand-ups. My Born to Bike team mate Katja was also racing the 12-hour TT the next day and kindly invited me over for dinner at the AirBnB where she was staying with her helpers. Katja has many more talents than just riding a bike fast; she is also a great cook. It is such a pleasure to enjoy good food and good company before a race and nothing goes above a good home-cooked meal. Thanks Katja: you are a super star! But I think this is Katja’s best trick to stand out. The next day I met Shu, who is the crew chief for my LEJOG record attempt, at the race HQ and quickly talked her through bottle hand-up strategy, spare equipment etc. As Rob and my husband Chris, two other members of my awesome crew will recall, the feeding strategy for a 12-hour race (well for someone who drinks as much as I do at least) involves quite a lot of bottles and it takes some thinking through what to hand up when and where and how. I love how Shu had really thought about her clothing strategy. Pretty much every single piece of clothing she wore throughout the day, no matter the temperature was bright pink, so it was super easy for me to spot her. 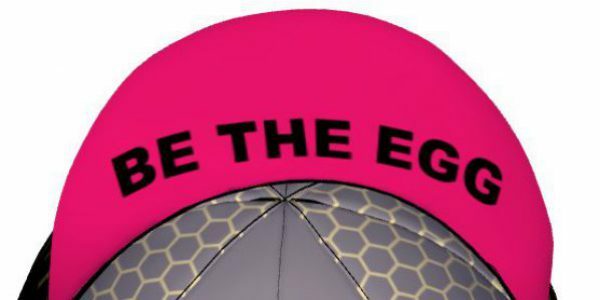 And of course, there was the crew version of the #BeTheEgg cap to help her stand out even more – I still have a few of the #BeTheEgg caps available: follow link. The race went really well. I felt happy throughout and having people sing ‘Happy Birthday’ to me as I went round and round the course really perked me up. A big thanks to all the supporters, timekeepers and marshals along the side of the road. And what a nice birthday present it was to achieve a PB of 269.1 miles and to win the race! Early on the conditions were fast and it had looked and felt like I may be able to get even closer (or surpass) Beryl Burton’s all-time record of 277.25 miles for 12 hours. But the wind turned and the conditions became a lot slower. I love racing when Jill Wilkinson is there. We are fairly well-matched and that helps to spur me on to do my best. I very narrowly beat her in the Nat 12hr TT Championships in 2015, but with 272.5 miles Jill is the one who has been nearest to Beryl Burton’s record to date. The first few hours of the Newbury 12hr TT were as much fun as the National 12hr in 2015, with Jill and I being pretty close to each other, but then my gap started to increase. The last time I saw her I think I had at least a 6-minute lead on her. Later on, I found out why: her handlebars had broken off the bike and the make-shift solution consisting of tape and a big spanner was no longer doing the trick! I was sad to see her leave the event and it’s probably a fair guess she didn’t have that much fun. Unfortunately, my Born to Bike teamie Katja was not having a great day either and like others she left the course after a few hours. The men’s race was affected in the same way with several of the favourites pulling out for various reasons. By the end of the race we were so dispersed, you could go for very long stretches without ever seeing another rider (which is odd on such a compact course). Apart from the very first banana hand-up (when I approached with way too much speed, sorry Shu! ), all hand-ups with Shu had been spot on. Thank you, Shu for all your support. You were awesome. Confident and positive, in the right place, at the right time. I have mega-confidence in you as a crew chief. Bring on the LEJOG record attempt! Big thanks also to Sonja, another fantastic member of my support crew, who was there to help alongside Shu and take some great shots (all in between running her own photography business and managing a family with three young children!). A lot of people used the area by the Hen & Chicken pub for their hand-ups. This is a great social spot (and convenient with a petrol station, little Spar, and pub toilet nearby), but I don’t like it so much because you come in with quite a bit of speed and, more importantly, the dual carriage way reduces to single carriage way at this point. Instead, we used the layby which is usually used for the start of 10-mile and 25-mile TTs on this course. The road goes up and by riding into the layby I may have lost some time and added some distance, but it is safer for both rider and helper. The road is dual carriage way here, so the cars also have more space to move when you exit the layby again. All-in-all, that adds up to 10.5 litres within 12 hours. That is quite a lot, but only just about right for me in these conditions and this intensity. As I have a high sweat rate and a high concentration of sodium per litre of sweat – if you want to find out more about yours, I’d recommend doing an advanced sweat test with Precision Hydration. My bike was lucky to survive the course without any bits falling off, but my body was quite beaten up by it, particularly my forearms where I had been leaning on the aerobar pads. I am looking to change the pads to a thicker neoprene base instead of the thinner pads that come standard with the Specialized Shiv TT bike and are covered in a webbing. At first it looked like bruises, but a week later, as the skin started to peel away slowly, it became apparent that they were actually burn marks. I cannot complain too much though as my crotch survived without too much damage or swelling for a change, despite the bumpy road. That was a good thing, given I had the next race lined up just one week later. After recovering for 4 days which included just the odd little ride and some walks, Chris and I boarded the overnight ferry from Harwich to Hoek van Holland on the Thursday night. The last time we took this boat was in September 2014 when I did a cycle tour of the Netherlands to visit friends and family. It is a great service. Departing Harwich at 11pm and dropping you off in Hoek van Holland at 7am in the morning after a good sleep in the cabins. Chris and I were both relieved though that the cabin speakers of the boat’s extremely loud and repetitive alarm system did not function in our cabin this time! By 8:30am we had arrived at Chris’ Dutch company office in Rijswijk. This is one of the things I love about my new job. Providing I don’t have client meetings of course, it doesn’t really matter if I work from my London home-office, or my in-laws in Sutton Coldfield or as on this occasion, Chris’ office in Rijswijk. As long as the work gets done and I can be reached. At the end of the work-day we drove to Scheveningen spending the night at Martin and Helen’s and my first opportunity to finally meet their son Flynn, who aged 2.5 already has an impressive vocabulary in German, Dutch and English. The next morning Chris and I drove over to Zandvoort where the race was held on Zandvoort Circuit, a motorsport race track in the dunes. Upon arrival there we met my dad who had driven over from his house in the middle of the Netherlands to come and support me for the weekend. Such a cool thing to do, especially as it was Father’s Day. For my dad, it was the first time ever that he could see me race. I am glad he enjoyed it and I was able to make him proud with a fantastic result. The race started at 12 noon. About half an hour before the start all participants had a chance to ride one lap together to get familiar with the circuit. After riding the 4,320 meter long circuit with its 13 corners, 1 ‘hill’ and 1 longer incline for the first time I was wondering what that ‘hill’ was some of the people in my pit were talking about. Compared to Brands Hatch where I rode Revolve24 as part of a 4-person team last year, this circuit is a lot flatter. But … after 179 miles of the circuit … I certainly felt it and full understood what they meant with the ‘hill’. The weather for this race was fantastic: dry, warm but not too warm, mild at night and very little wind. Such little wind, that I dared to ride my deeper section wheels despite this being a draft-legal race and being very close to other riders in the pack for at least some of the time. Just a little after 12 o’clock the start sign was given and we were off. As with most of these circuit-based 24-hour races, it starts with a ‘Le Mans-style’ start: i.e. the riders need to start on foot and run to the either side of the track before mounting their bikes and racing off. As expected the fast guys went out hard and I couldn’t stick it with the peloton for the first few laps. This is a draft-legal race so – providing you have the legs for it – the fastest and easiest way to rack up the miles is by staying in the peloton. That is easier said than done, because the guys riding the race as a relay in team of 4 or 8 will smash out some pretty fast laps; yet the solos need to keep going for 24 hours. The fast teams will also try to shed riders from the peloton and attack, especially if they see a rider from another fast team going into the pits for a changeover with a team mate. This style of racing, plus 13 corners and some inclines means that as a solo rider you need to have both the top end to be able to continuously keep up with the accelerations and the endurance to keep up the speed for 24 hours. No mean feat and very much the opposite to a 24-hour time trial where the effort will comparatively be much more even. Of course there is no need to try to ride with the peloton, but the longer you can stick it with the pack, the greater your mileage. This strategy was more than proven by 24 hour solo winner Thijs Verbrugghe from Baum Cycles Endurance Team. Arguably he had a few of his team mates who were participating as 2 teams of 4 to help him a little bit (i.e. not expecting him to take turns), but I bet he would have been awesome without his team mates too. His FTP is probably quite a bit higher than mine, but his top end is pretty strong too. Amazing how for all but the fiercest attacks he was always able to just cruise in the peloton. Occasionally I would see him on his own, he would carry on for a bit, then wait for the peloton, confident that he would be able to jump back in with ease and stick with them. I tried that strategy twice, but that was a lot less successful for me. Instead I tried to ride in the peloton where I could, work with little groups when fallen off the back and just soldier on alone the rest of the time, I am a time trial specialist after all and there won’t be anyone to draft for the Land’s End to John o’Groats record attempt either! The circuit was a lot of fun to ride. Smooth, wide, nothing too challenging and fairly sheltered in the dunes. I had initially asked my dad and Chris to support me from the dedicated pit garage, but it only dawned on me once the race has started that, instead of riding into the pit lane from one end and exiting at the other (as was the case at Le Mans 24 and Revolve 24), the organisers had marked off an area for quick team changes at the end of the pit lane. This meant it would mean doubling back on myself to go towards my pit garage each time. So I tried to signal and shout to my dad and Chris to move to a grassy section at one of the numbered corners on the circuit which the organisers had dedicated as support/stop area for solo riders. It took a little while for them to understand what I wanted them to do, but eventually they moved camp which was much more convenient for food and drink stops. Unlike at a long time trial I had decided not to bother with bottle hand-ups for this race. If I was in the peloton, I would be passing them with too much speed anyway and would be afraid to drop the bottle and cause harm to others. Plus this race was not an ‘A’ race for me. Mostly I just wanted to have fun and enjoy the opportunity to finally race somewhere where my dad could see me. My mum and her husband had been supporting and cheering me on at Le Mans 24 in 2013, but my dad had not had this opportunity yet. All in all, I think I stopped for 30 minutes in 24 hours, to take on new bottles, eat bananas, krentenbollen (Easter buns), and put on/off lights. The atmosphere at Cycling Zandvoort was great with a DJ pumping out some great tunes and lots of happy cheering people along the side. On Saturday afternoon my half brothers and Minke turned up to cheer me on for a few hours. I think one of my half-brothers enjoyed it so much, he did not want to leave! The next morning, Chris’ friend Martin, who we had stayed with the night before the race, also came down to watch and he stayed all the way until the end. I was impressed by Martin’s neighbour who had cycled over from Scheveningen to watch the end, and ride back again. It is important to motivate yourself, but it is also really nice to be able to draw motivation from so many friendly people willing you on. That includes supporters as well as riders. I forgot all the names, but there were so many fantastic riders on the circuit who allowed me to sit on their wheel for a bit. Apart from one point between 2am and 4am where I stopped for extra caffeine as I started to get a bit drowsy and the early morning mist hanging in the dunes, I didn’t have any real low points. Well, apart from the very end when there was just nothing left in my legs. My glutes and hamstrings had been completely over-worked and I had given myself a sprained wrist/lower arm from thousands of shifts over 24 hours (I couldn’t open any bottles for a week after and Chris had to do most of the paddling the weekend after during our kayak break in France with friends..). Assos S7 T.Laalalai: funny name, but awesome bibshorts! But… the biggest achievement perhaps, was emerging from the race with my crotch completely in tact. Not a single blemish. It looked like I hadn’t even ridden at all. The secret: Assos S7 T-Laalalai bibshorts. They were a real pleasure to wear. I will wear them whenever I can from now on. In the end, in the solo 24-hour category, Thijs Verbrugghe from Baum Cycles Endurance Team finished with an astonishing 203 laps = 870 kilometers or 540 miles in 24 hours. Andreas Schwalger from Kleve (with whom I had cycled quite a few chatty laps) came 2nd with 184 laps, and I came third with 179 miles = 771km or 479 miles. A huge PB for me compared to Le Mans 24 (where in 2013 I covered 674km) and amazing to come 3rd in a men’s race! (I was the only woman, so technically I also came first and last in the women’s race). I know it is quite a different format compared to the National 24 hr TT Championships coming up on 22 and 23 July here in the UK, but still it gives great confidence and I very much look forward to that event. Next Post National 24hr TT – WIN !